What if we get the chance to rectify all the big mistakes of our life? And what if a magical wand—or a pundit’s jigerypokery—takes us into the future to personally witness all those critical twists and turns on the road journey of life where we may swerve into the wrong lane? And then what if we get a chance to revise our actions and deeds accordingly? Debutant director Nitya Mehra’s Baar Baar Dekho is unlike any romantic yarn—I hesitate from giving it that loosely-used term the ‘rom-com’. It is the ultimate what-if saga, narrated with a tender care and subdued splendor that make every moment between the lead pair precious and gladdening. Watching the film we are just happy to see Jai and Diya togeth. It could be because they are played by two of the best-looking stars in our cinema. 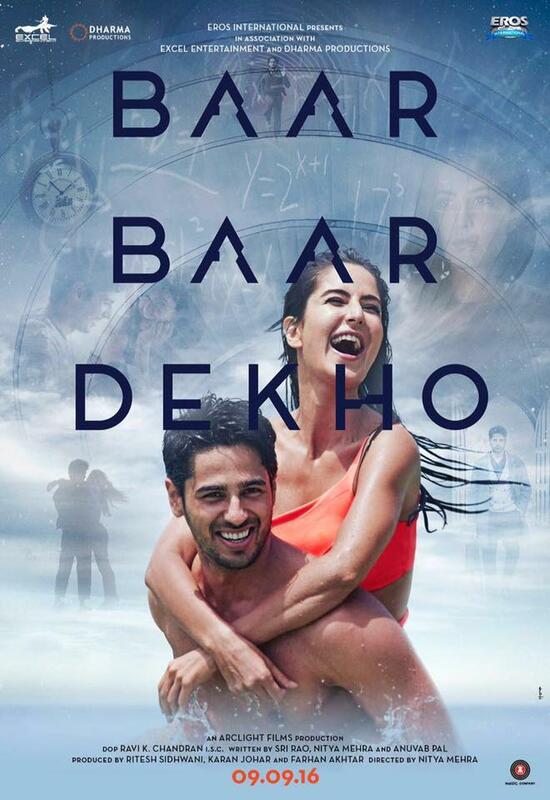 Sidharth Malhotra and Katrina Kaif look so made-for-each-other it seems absurd to even suggest that can be separated by destiny or designed, or in this case by designed destint. But human nature is such—and this is the sach that this unusually conceptualized film dwells on with mollifying magnificence—that it sinks the very ship that keeps hope afloat. With believable nearsightedness—don’t we all mess up in life? Jai tells Diya on the day of their wedding that he would rather not marry her and pursue his dreams of going to Cambridge. The hurt, humiliation, bewilderment, and disappointment that Katrina shows on screen in her sequence of painful rejection dashing hopes of shared lifetime, is a joy to behold. This is the first occasion in her career when Katrina has actually sunk her ego into her character. You can see her feeling the hurt and the happiness with equal sincerity. Bravo. Siddharth Malhotra, so far seen giving performances where his matinee-idol looks obfuscating his other purported virtues, comes into his own with a character who is clueless about the stunning time travel that fate/destiny/karma/kundli puts him through. It’s a morality fable bolstered by bouts of effervescence, nostalgia regret and pain.It takes us a while to fall into a rhythm and pattern, as Siddharth Malhotra’s character of the maths teachers hurls from one age-span into another in pursuit of the unforgivable lapses that could ruin anyone’s life. Just imagine: you fail to show up for your wife’s painting exhibition and she falls in love with her arts dealer. Or you may not cuddle your little daughter when she asks you to so, and this may cause indelible damage to your domesticity. Exceptionally, Baar Baar Dekho trusts silences to the talking. There are long passages without background music to over-punctuate the drama of disintegration that the couple plays out. The emotions the couple exchange seem relevant and real, as the dialogues (by Anvita Dutt) rip off pages from contemporary marriages all over the world without creating a cut-and-paste haste in the conversations. There is plenty of the rare quality of gravitas tucked away in the mischievous love tale, none more mischievous than the Pundit (played with able astuteness by Rajit Kapoor) who is supposed to solemnize Jai and Diya’s wedding. Jai thinks the Pundit is responsible for his rushed futuristic time travel. But is he? Is this ability to stare your mistakes in their eyes a quirk of fate? Or is it something else? Baar Baar Dekho doesn’t seek or give us substantiated answers on cosmic mysteries. Why Man does what he does, who is responsible for our actions—sometimes horribly wrong—we don’t know. Neither does the film. Director Nitya Mehra glides with a silent giggle and a sigh across a beautifully painted skyline of wistful thinking. There is plenty to celebrate in Baar Baar Dekho, not the least of its virtues being the ability to deliver marital home truths without sermons or soliloquies. As the film’s main premise suggests, the success of a relationship is in the smaller details. Likewise this film. It strings together scenes from a situation of marital calamity with an easygoing swagger that Ingmar Bergman would have found distracting. Kaif and Malhotra have given their heart and soul to the main parts. And some of the supporting cast—not all, I am afraid—is also exceptional. But the real hero of the film is Ravi K Chandran’s camerawork. The magician that he is, Chandran imbues every frame with warmth charm and beauty. Sequences recreating the Cambridge University (where a Ramanujan-like professor mentor Jai) reminded me of that very fine Ramanujan bio-pic The Man Who Knew Infinity. The futuristic styling is apt without getting outlandish. Come to think of it, there is nothing over-the-top in this quietly accomplished film except the ‘Kala Chashma’ song and dance. Why on earth was it used to promote the film? That zingy cheesy aura of that song is so NOT the film. Baar Baar Dekho is about getting a chance of changing the mistakes in life without making them. But really, I can’t think of one thing I’d like to see changed in this film. Except maybe Sarika’s prosthetics when she plays dead. Someone overdid Mother’s wrinkles.